After five years of the Inez Milholland chair standing empty in Essex County, upstate New York, it is now filled with a woman elected to office. No woman has served on the Essex County Board of Supervisors since 2013. This resulted in the the group of outgoing lawmakers to set aside a chair for the next woman to join the board. Now, North Hudson Supervisor Stephanie DeZalia, has been sitting in the chair since her recent election. DeZalia, appointed to replace Ron Moore in December 2018, said the chair represented hard work, dedication and sacrifice. The chair was dedicated to suffrage activist Inez Milholland. Milholland, a Lewis, NY resident, addressed the Essex County Board of Supervisors in September 1911 when she asked them to support the women’s suffrage bills then being considered by the state legislature. New York State women won the right to vote in 1917. Newcomb was the only town in Essex County to vote in favor in the amendment. DeZalia can take the chair back to her town office, or keep it at its current location at the Old County Courthouse. Highlights of the finding aid for Inez Milholland’s papers at Harvard University Library. 1. Photograph of Inez Milholland, n.d.
PLUS MUCH MORE…This is just a representative sampling of the available material. STRETCHED THE BOUNDARIES OF THE VOTES FOR WOMEN MOVEMENT! Between 1910 and 1916, she became a central figure involved in planning, speaking, and raising funds for the drive for Votes for Women in New York State. She chaired meetings, answered opponents’ arguments, lobbied state legislators, and led suffrage parades up Fifth Avenue. Robed as the “free woman of the future,” she became nationally known for her role as a mounted herald leading the great March 3, 1913 suffrage procession in Washington, D.C. that involved thousands of supporters and political figures. Four months later, she married Dutch businessman Eugen Boissevain. One of few women attorneys in New York, Inez specialized in criminal and divorce cases but faced prejudice and other obstacles to securing paying clients. She vigorously participated in a grand jury investigation into conditions at Sing Sing Prison and once raced to win a last minute reprieve for a laborer sentenced to die. Having seen the brutal conditions in prison, she spoke out for reform, opposed capital punishment, and assisted individual inmates with filing appeals and finding jobs. Like her father, John Milholland, the first treasurer of the interracial NAACP, Inez opposed racial discrimination, supported the rights of workers, and advocated a wide range of reforms including international peace. At the beginning of World War I, she joined Henry Ford’s “Peace Ship,” which unsuccessfully tried to steer the European warring parties into mediation. When her health failed during the strenuous tour, Inez put off medical treatment rather than quit. In late October, exhausted and overcome by pain, the young suffragist collapsed while demanding liberty on a stage in Los Angeles. A month later, despite repeated blood transfusions, she died of pernicious anemia, having just turned 30. Fellow suffragists recognized that her leadership, love of democracy, and devotion to women made her a martyr to the cause. Inez was buried in Essex County, New York, and on Christmas Day 1916 the Woman’s Party held an unprecedented memorial for her under the rotunda in Statuary Hall in the national Capitol. She became the first woman to be so honored. A week later, aroused by her sacrifice, suffragists began to picket the White House demanding that President Woodrow Wilson support for the suffrage amendment. Throughout the year, their banners carried her final plea: “Mr. President, How Long Must Women Wait for Liberty?” Inez inspired thousands of suffragists through the final, climactic years of the movement and her memory lived on in the ensuing years. Inez Milholland Boissevain spent her life seeking justice, equality, and civil rights for American women. Because of her work, and the persistence of tens of thousands of American suffragists from 1848 to 1920, the 19th Amendment to the U.S. Constitution ensures women’s voting rights now and for future generations. 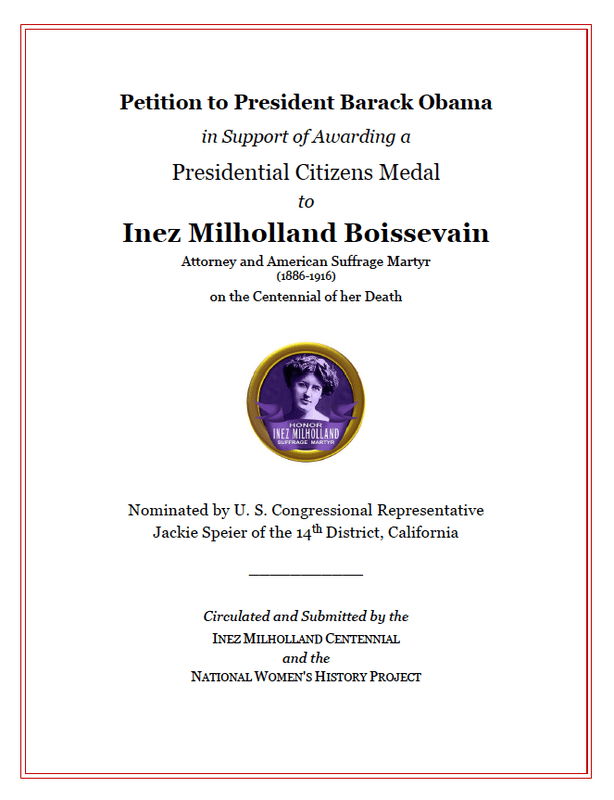 IT’S NO WONDER THAT A US REPRESENTATIVE NOMINATED INEZ MILHOLLAND FOR A PRESIDENTAL CITIZENS’ MEDAL! Inez Milholland was a lawyer specializing in criminal and divorce practice; she zealously advocated a variety of reform causes, including women’s suffrage, abolition of the death penalty, and the rights of working people. Born in Brooklyn, New York, she graduated from Vassar College in 1909, and received an LL.B. degree from New York University in 1912. In July 1913, she married Eugen Jan Boissevain, a New York importer, of Dutch citizenship. The resulting change in her citizenship status threatened to exclude Milholland from law practice, and she quickly became involved in attempts to repeal the offending legislation. Proclaiming herself a Socialist, Milholland joined the Women’s Trade Union League, the National Association for the Advancement of Colored People, and the Fabian Society of England. In 1915, as a war correspondent in Italy, she wrote a series of pacifist articles and as a result was expelled by the Italian government late that summer. In 1916, Milholland took part in a garment workers’ strike and was instrumental in securing a last-minute reprieve for Charles Stielow, a West Shelby, New York farmer accused of murder and sentenced to be executed in the electric chair. Concurrently, Milholland was becoming increasingly active in the women’s suffrage movement. She joined the Congressional Union, and, though suffering from pernicious anemia, undertook a speaking tour of the West in support of suffrage. In September she collapsed during a speech in Los Angeles and died ten weeks later, on November 25, 1916. A memorial service was held by her suffrage associates in Statuary Hall, Washington D.C., on Christmas Day, 1916. She was buried at her parents’ estate in Essex County, New York. Some years after Milholland’s death, Eugen Jan Boissevain married Edna St. Vincent Millay. This collection was subsequently passed on to Edna St. Vincent Millay’s sister, Norma Millay, from whom it was purchased by the Schlesinger Library. LetsRockTheCradle.com is a public service for interested people and the media about the suffrage centennial celebration in 2020 when US women will have been voting for 100 years. Check on early voting status in your state! Find out when early voting starts in your state. This way you can put the dates on your calendar and then when Election Day rolls around, you will be ready. In 2020, U.S. women will have been voting for 100 years. 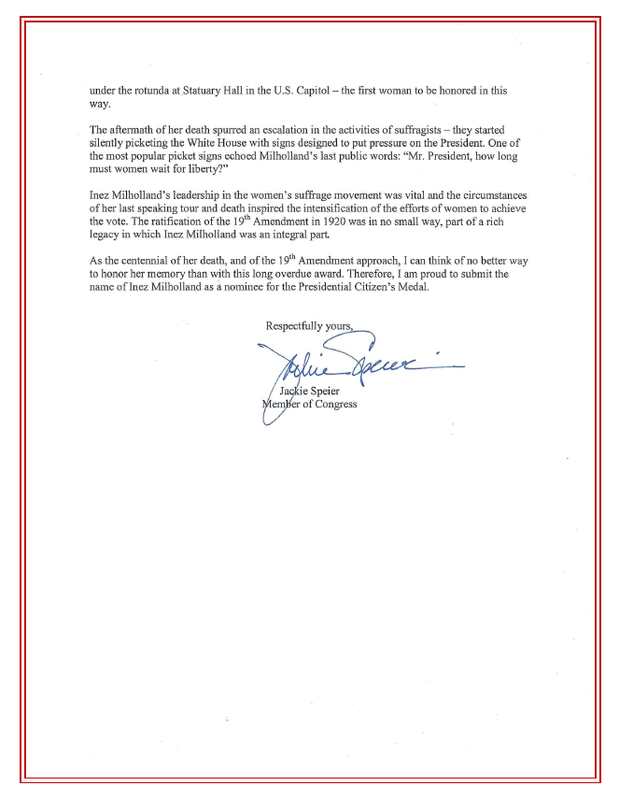 Support and honor Inez Milholland! When women voters have a reason to vote, such as their knowledge and affection for Inez Milholland, it’s much easier to plan. 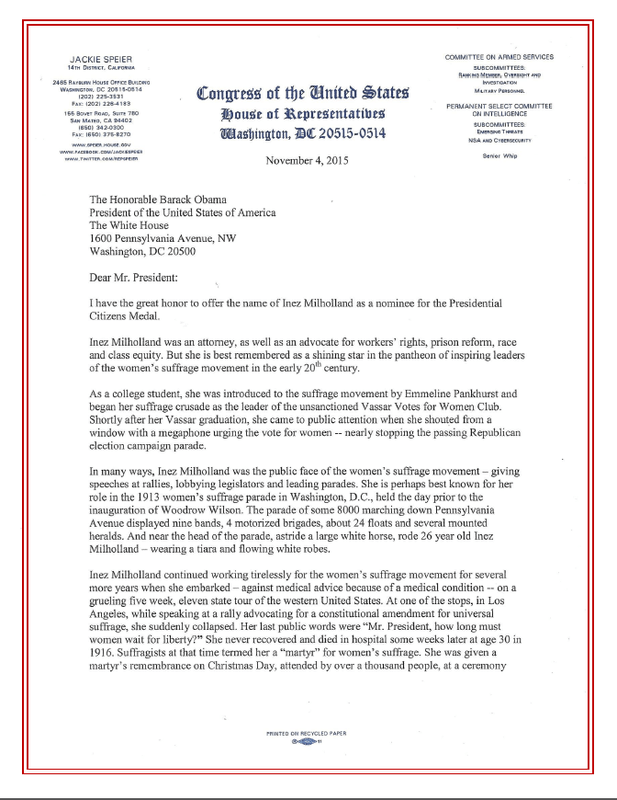 Inez Milholland included in national votes for women trail! NEWS: There was an Inez Milholland march in January this year. Smaller than last year, but respectable nonetheless. Congrats. National Votes for Women Trail – GoFundMe from NCWHS on Vimeo. When you visit Lewis, New York you’ll see road markers pointing you to Milholland’s former home and grave. It’s the destination for many travelers and a spot on the growing national Votes for Women Trail that’s raising funds to build a web site directing travelers to important women’s history sites across the nation. This is an important part of the upcoming 2020 votes for women centennial observance in the United States. Give the US suffrage martyr the attention she deserves. Have you seen the film about Inez? Visit InezMilholland.org. Spread the word about this blog, InezMilholland.wordpress.com that has been publishing since 2016 when the Women’s History Alliance (formerly the Women’s History Project) devoted a year to commemorate the 100th anniversary of Milholland’s death. Inez Milholland will receive the recognition she deserves in 2020, the US celebration of US women voting for 100 years. Stop by SuffrageCentennials.com to find out some of the preparation (and anticipation) for 2020. For media inquiries: LetsRockTheCradle.com is a public service to highlight the US preparation for 2020 when US women will have been voting for 100 years. Suffrage Wagon News Channel features an important symbol of the first wave of the women’s rights movement in the US. The “Spirit of 1776” suffrage wagon will be on exhibit at the New York State Museum in Albany, New York. Visit the site to find out exhibition information for 2020. Activist Edna Kearns who used the wagon for grassroots organizing in 1913 in NYC and on Long Island knew and worked with Inez Milholland. Marguerite Kearns is the granddaughter of Edna Kearns.